Whether they’re enhancing educational opportunities, improving access to quality health care, or providing new ways for locally owned businesses to succeed, our region is home to a long list of exceptional women who continue to transform the landscape of South Jersey. In 2011, the business climate continued to improve thanks in large part to the dedication and tenacity of these female business owners and executives. They’re serving as trailblazers within careers once dominated by men, breaking the glass ceiling despite the nation’s ongoing economic struggles. Our readers have spoken: The following 15 female leaders in business have been voted this year’s Women to Watch. For Marilyn Kleinberg, helping her fellow businesswomen succeed was as simple as the click of a mouse. Launched in 2000, eWomenNetwork was designed as a high-tech way to help professional, like-minded women connect—without having to leave the office. One step ahead of the social media frenzy, the site expanded into an organization with chapters across the country that bring women together for networking events. Kleinberg joined the Philadelphia chapter in 2006, and, two years later, purchased the rights to start a chapter in South Jersey that would cover Burlington County to Cape May. The chapter currently boasts more than 300 members. “When I see the incredible women that we’ve brought together to share their resources, contacts and wisdom, I’m in awe of the positive energy, positive opportunities and the positive relationships we’ve built that translate into personal and professional growth for all of us,” she says. The networking group hosts at least three events per month and is hosting a two-day conference in Atlantic City on March 7, the 3rd Annual Women’s Success Summit, to help women who are seeking to network, transition and grow personally and professionally. Later in 2012, the organization will award a grant to a local non-profit specializing in supporting women and children. Sharon Cameron’s roots in South Jersey were grounded as the marketing manager for Campbell Soup Company. Today, she serves as the president of an enterprise that affects some 15 million people across the country. American Water Enterprises employs more than 7,000 people and provides more than a billion gallons of water each day to more than 30 states and two provinces in Canada. In her role as president, Cameron focuses on developing innovative technology solutions, such as water reuse and distillation. She also manages the Service Line Protection Program, which educates homeowners on water and wastewater service line ownership and responsibilities while offering affordable solutions to water and sewer repairs. “What’s most rewarding about my job is being able to identify innovative ideas that are focused on customer solutions,” she says. Proud of her ability to offer personal service and attention to each and every client, Devan J. Theiler, Esq., accomplished what was seemingly impossible: co-founding a law firm just three years ago, in the midst of one of the worst economic downturns in the country’s history. “We managed to find a way to grow, and I think personal attention is really making a difference,” she says, noting that clients always have access to her personal cell phone number. Theiler was recently selected for inclusion in Super Lawyer’s Rising Stars, which is a fully independent evaluation of attorneys nationwide. The rising star designation, for those attorneys under age 40, is limited to the top 2.5 percent of all attorneys in the entire state. She is most passionate about practicing family law, and predicts significant growth for the firm in 2012. “Our firm aims to empower our clients,” Theiler says. Whether she’s taking on projects for schools, higher education institutions, or private health care and social service organizations as owner of Heather Simmons Communications, or serving as a liaison to the departments of Economic Development and Public Works in her capacity as freeholder for Gloucester County, Heather Simmons is adamant about making a difference in South Jersey. “It’s huge for me to be able to take the breadth of my personal and professional experience and put it to work for my community,” she says. As freeholder, Simmons concentrates on the relationship between education and job creation; she played an integral role in developing the budding partnership between Rowan University and Gloucester County College. While she works to create opportunities for skills and workforce development, and higher education attainment and career opportunities within Gloucester County’s borders, her public relations business serves local educational and non-profit organizations. “Women get involved in their communities to make a difference … to improve the lives of their kids and to make things better for people like themselves,” she says. Since founding the New Jersey Technology Council in 1996, Maxine Ballen has remained committed to helping make New Jersey a state that’s ripe with opportunities for technology companies. The NJTC remains the only trade association to represent some 950 technology companies in the region across all of the state’s varied technology sectors, from electronics to environmental, energy to telecommunications. The council sponsors some 120 events per year, and owns its own $80-million venture fund, two publications and the Jumpstart NJ Angel Network. Co-founded by Ballen and Caren Franzini, CEO of the New Jersey Economic Development Authority, Jumpstart is a member investor group that invests in early-stage emerging technology companies throughout the mid-Atlantic region. It’s recognized as one of the most active Angel investor groups in the region, and has invested more than $29 million since 2004. With a career spanning more than 35 years of leadership in government service, nonprofit and community organizations, Levin has served as the backbone for a range of community projects, including building more than 50 parks and the new public library in Cherry Hill—she served as the township’s mayor for 14 years—and developing housing assistance for families victimized by domestic violence. Through her most recent role with The Cooper Foundation, she continues to work closely with community nonprofit organizations to revitalize the neighborhoods surrounding the hospital, including housing and streetscapes. Cooper University Hospital began as a four-story stone building with 30 beds to serve the indigent population of Camden. Today, it is one of just three hospitals in the state designated as a Level 1 Trauma Center and is a leading provider of health services, education and research thanks in part to the dedication of leaders such as Levin to serving the residents of Camden and surrounding areas. Through her guidance, the foundation holds multiple fundraisers throughout the year to support capital projects at the hospital and enhance its patient and community education programs. An ovarian cancer survivor, Levin led the Cooper Cancer Institute Task Force to build a $100 million Cooper Cancer Institute in Camden, which will break ground in April. The Cooper Foundation will also help open the new Cooper Medical School of Rowan University in August. Beginning her career as a preschool teacher, Liz Jaworski continues to wear many hats as she employs her 30 years of professional experience as general manager for husband Ron Jaworski’s golf course management company. 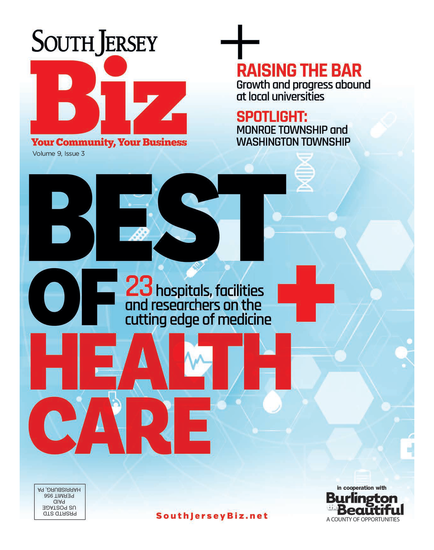 The company’s three courses in the South Jersey region are Valleybrook Country Club in Blackwood, RiverWinds Golf and Tennis Club in West Deptford, and Running Deer Golf Club in Pittsgrove. Jaworski was instrumental in founding a “Ladies Night” golf clinic at Valleybrook; the weekly class is attended by more than 100 women. “I’m very proud of the clinic, because I love to see how the industry has expanded to include different groups from youth to women,” she says. She also remains involved in junior camps and clinics available at all three courses, and helps manage special events such as cooking classes at Running Deer and Elvis-inspired entertainment shows at Valleybrook. But her community involvement extends beyond the golf course, as she serves on the board of directors for the Jaws Youth Playbook, which works to improve the health of at-risk youth in the Greater Philadelphia Area. As director of external affairs for Verizon, Jennifer Young does her fair share of communicating: She is responsible for the company’s relationship and interaction with municipal and county governments in Camden, Cape May, Cumberland, Gloucester and Salem counties. She has also assumed roles in community relations, local government affairs, economic development, and consumer, education and local media relations in South Jersey. Young is never afraid to dig in her heels and make change happen in her community. She is responsible for local corporate philanthropy and employee volunteerism, which has included providing grants to educational organizations like Bancroft in Haddonfield, and cleaning up state parks and other preservation facilities. “The company’s philanthropic arm, the Verizon Foundation, focuses on partnerships and programs in the areas of education, literacy, domestic violence prevention and health care,” Young says about the foundation’s success, which she helps accomplish through employee volunteers, matching gifts and scholarships. Young also serves as vice chair of the LEAP Academy Board of Trustees in Camden. Ninfa Saunders strongly believes in the power of education and mentorship, which is part of the reason why Virtua has evolved from a group of community hospitals into a regional organization with a unified culture and operating system that is earning an international reputation. Saunders was involved in expanding Virtua’s learning environment to include the creation of the Center for Learning, a setting for staff to experiment with new methods of delivering care, learn new skills, and develop personally and professionally. She is also behind efforts to develop a “system of care” to ensure that each patient receives the right care at the right place at the right time. To further achieve Virtua’s goals to provide easy access to physicians, exercise, nutrition and support programs, this year will mark the opening of a new health and wellness center as well as an ambulatory care center; the ambulatory center will be open in March on the campus of the new Voorhees hospital, a 368-bed facility opened in May 2011, and the wellness center will open in Moorestown this fall. “There’s nothing more rewarding to me than sharing knowledge and creating an environment of mentorship,” Saunders says. Before serving as chief marketing officer for Winning Strategies PR, Judi London was taking a hands-on approach to growing the economy in the Camden area. During her time with the Waterfront Marketing Bureau, Delaware River Port Authority and South Jersey Tourism Corporation, London became well known for her success in branding and marketing the waterfront and Adventure Aquarium, in addition to the greater South Jersey region. Today, London channels her wealth of experience in tourism, transportation, economic development and real estate into Winning Strategies, where she focuses on South Jersey and has led efforts to expand the company’s marketing capabilities into online and digital venues. Locally, her firm has worked with a large North American logistics company to elevate its presence in coveted trade and business media, in addition to placing clients such as a local education company on the national media stage, including in the The Huffington Post. Since becoming an entrepreneur in 1998 with the co-founding of Thomas/ Boyd Communications, Pam Boyd has app?lied more than 20 years of experience to represent clients and generate extensive media coverage. Boyd’s firm has become an award-winning, go-to agency because of how closely she works with her clients—from health care to Fortune 100s to not-for-profit organizations—to produce positive results. “We don’t believe in a ‘cookie cutter’ approach. Our work is customized to meet our clients’ strategic needs. We’re responsive, well-connected and passionate about what we do,” she says. Responsible for business operations, development and communications strategies for the agency’s diverse client base, Boyd is well versed in marketing, social media, corporate communications and special events. “Clients appreciate that every account is represented by an owner of the business,” she says. In 2011, Liza Cartmell seized the opportunity to make a difference in South Jersey as CEO of the Atlantic City Alliance. After leaving her 20-year career with ARAMARK Sports and Entertainment Group, it wasn’t long before the opportunity to take charge of the alliance—formed by legislation passed by Gov. Chris Christie in an attempt to bring the Atlantic City marketplace back on its feet after a five-year tourism decline—fell into the South Jersey native’s lap. “It was an opportunity to make a difference in a marketplace that’s important to New Jersey,” Cartmell says. The nonprofit organization relies on $30 million annually from the casino industry to market and promote the city. Denise Kassekert is dedicated to mak?ing a difference in her neighbors’ lives as senior vice president of Beneficial Bank, the oldest bank headquartered locally, dating back to 1853. Kassekert applies more than 25 years of banking experience into directing and overseeing all Relationship Banking sales efforts and operations at the bank’s 60 offices throughout Pennsylvania and South Jersey, where she is responsible for business development, customer service, deposit growth, profitability and growing core deposits. Originally founded to teach America’s working-class immigrants how to manage their money properly, Beneficial will finalize the acquisition of St. Edmond’s Federal Savings Bank this year, growing their local network of community-focused banks. Anne Koons has been helping South Jersey residents sell or buy their homes for more than 25 years. As a real estate professional, she does everything she can to put her clients first and remain accessible to their needs—which may contribute to her being among the top 1 percent of agents nationwide, according to Forbes. Koons’ career has survived the ever-fluctuating housing market, and she now helps her company implement the latest real estate tools by embracing changes in the form of everything from Internet marketing to social media. “I could have easily sat on the sidelines, but if you want to grow your business, I learned that you have to embrace change,” she says. Koons also served for 20 years as a member of the board of directors of Sun Bank Corp., and still serves on the board for the Cooper Hospital Foundation. She sponsors a reading program along with Cooper University Hospital, in addition to serving as chair for the Mercedes Benz-sponsored golf tournament that has raised more than $2 million for the hospital’s pediatric department. Whether she’s growing her business as a local real estate professional or donating thousands of dollars to worthy causes as a philanthropist and trustee of the William G. Rohrer Charitable Foundation, Linda Rohrer’s first priority is serving the community. “Whether I’m working with someone to find their first house or giving scholarships to people who don’t have the necessary funds for their education, my job is helping people,” she says. Rohrer’s father served as mayor of Haddon Township for 36 years. With her father’s guidance, she opened her own business in commercial real estate in 1985—an industry that at the time was dominated by men. Rohrer launched the William G. Rohrer Charitable Foundation in her father’s name upon his passing in 1989. A former high school teacher, Rohrer’s passion for education is evident in the role she continues to play on the board of trustees for Rowan University and on behalf of the charitable foundation; in 2005, the foundation contributed $10 million to what became the William G. Rohrer College of Business at Rowan, in addition to providing millions of dollars in funding for scholarships, and she helped develop the university’s first endowed chair, the William G. Rohrer Professorial Chair in the College of Business. In 1997, the foundation awarded a million dollar grant to Camden County College; the college’s William G. Rohrer campus opened in Cherry Hill in 2000. Published (and copyrighted) in South Jersey Biz, Volume 2, Issue 2 (February, 2012).